This body wash cleanses and moisturizes for a clearer, healthier, brighter skin tone every time you shower. It cleanses the skin gently and prevents the formation of bacteria from the skin, without causing any irritation whatsoever. It softens the skin while it works on three different levels to renew and rehabilitate the upper layer of the epidermis resulting in a dramatic visual improvement of the skin`s tone and texture. Explore the entire range of Shower Gels & Body Wash available on Nykaa. 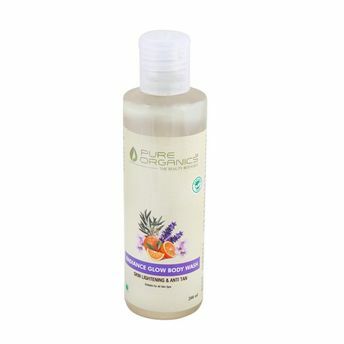 Shop more Pure Organics products here.You can browse through the complete world of Pure Organics Shower Gels & Body Wash .Alternatively, you can also find many more products from the Pure Organics Radiance Glow Body Wash range.